Super Mario Galaxy, the first 3D Mario action game for Wii, will go on sale on November 1st (November 16th in Europe). I know there are quite a few people who question whether a 3D Mario action game is truly fit for Wii. So I have decided to ask the developers in detail about what went through their minds while they were creating this latest addition to the Mario series. By the way, this time around I have asked for help through this interview from (Akinori) Sao-san, the former editor-in-chief of the Nintendo Dream magazine and now a freelance writer. Sao-san, thank you for being with us today. The pleasure is mine. Thank you for having me. Actually, it's been a full six years since I last talked with you up close like this. Yes, I remember. That was the year the GameCube was released, and it was the very last work day of the year. You remember so well! (laughs) Back then I had asked you to do an extended, full interview with me. Still, this time I feel a little nervous being involved in such a special occasion now that I am in a different position. But at the same time, I'm really excited that I get to hear about the true successor to the 3D Mario action game series from the various developers in this four-part interview. Super Mario Galaxy was developed by our EAD (Entertainment Analysis and Development) Tokyo office. The staff were going through the peak of the development cycle during this interview, so I have decided to personally head over here to Tokyo. 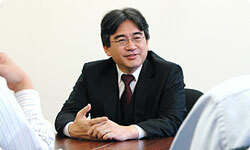 So this and the next interview, the first two of the four, will be brought to our readers as an interview special, "Iwata Asks (Business Trip Edition)". Now, for the first part of these interviews, I’d like to interview the producer and the director of the project. Please begin by introducing yourselves. I am Shimizu, and I work as the producer at EAD Tokyo. For Super Mario Galaxy, my main task was to create a work environment where everyone in the staff could focus on development. Hi, I am Koizumi, also from EAD Tokyo where I worked as the director for this project. Since Shimizu-san handled the task of communicating with all our outside sources, I was able to plunge right in and focus on development with the other staff members in the lab. 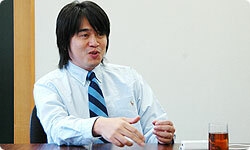 Oh, and it was also my job to “interpret” (Shigeru) Miyamoto-san’s comments for the developers. Now, please tell me how this project first started. The story goes back to the year 2000. It was during the GameCube presentation event1, where we revealed a demo called “Mario 128”2.I was the director of that demo. After that event, I kept thinking of ways of somehow turning the system used in Mario 128 into a product. However, I had always thought that realising this would be close to impossible. 1 The GameCube presentation event was held at SpaceWorld 2000, a video game trade show hosted by Nintendo, which was held at the Makuhari Messe in Chiba, Japan in August 2000. 2 Mario 128 is the name of the demo that offered a glimpse of the power of the GameCube. This demo is also known as “100 Marios”. Why did you think this was impossible? It was for technical reasons. In Mario 128, the platform was built in the shape of a flying saucer, but to change the platform into a spherical shape that Mario could freely roam around on would require a high level of technical expertise. I also felt that the motivation of the team members had to be very high in order to overcome this obstacle. Incidentally, I had heard about the spherical platforms from Miyamoto-san more than five years ago, though at the time, I didn’t quite understand why having spherical platforms would be so ground-breaking. However, as Mario Galaxy began to take shape, I finally started to understand. At the time, I felt the same way. It sounds interesting, but I wasn't sure whether or not it would be worth the effort. Thinking back, this probably was a thought that was shared by everyone in the staff. But Miyamoto-san kept saying over and over again that he wanted to make it happen. So, about two years ago, after we were finished developing Donkey Kong Jungle Beat3 for the GameCube, we had some time to plan what our next game would be. I had suggested creating a new, original game on our own, but then Miyamoto-san said in a rather sad tone, "I wish you could make a game with Nintendo characters...". (laughs) 3 Donkey Kong Jungle Beat is a side-scrolling action game for the Nintendo GameCube which can be played with the DK Bongos, an optional bongo-shaped controller. The EAD Tokyo office had just opened in 2003, and at the time, we didn't think we were able to make such a large-scale game. So, I had suggested plans for a rather smaller, compact game title. But then Miyamoto-san asked me "Don’t you want to work on something bigger? ", so I asked the staff members for their opinions, and somebody in the team said how he wanted us to use our skills to make the next Mario game ourselves. By working on Jungle Beat together, I got to know the staff well enough by then, and I thought that with this team, we may just be able to tackle the new and difficult challenge of making spherical platforms work. But the development process wasn't smooth. Of course. I worked on this project thinking that I had taken on the role of the cook. First, I showed the recipe to everyone saying "I want to make this kind of dish on Wii", but nobody in the staff was able to imagine the finished plate. So just showing them the recipe wasn't enough to get them to figure out whether the finished dish would taste good or not, then. Miyamoto-san told me “This looks tasty”. However, almost everyone in the staff told me they couldn’t make a dish of this grandeur. Hearing that, I felt the need to make a sample plate. Gathering several staff members, we created a prototype that took about three months to make. A spherical shape would be best understood as a planet, so we put that in outer space and added gravity. 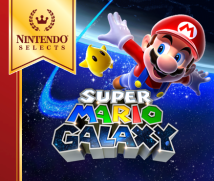 It looked just like a bare minimum version of the current Super Mario Galaxy. That's where the development really took off. So no matter how wonderful the recipe you show them may be, it’s a lot easier for everyone to understand the final dish once they’ve actually tried a sample, even if it’s just a small portion. Correct. I look at this as if I had borrowed a vegetable garden from Miyamoto-san. It was as if I had asked him, "Please let me borrow your ‘secret garden’. I promise I will produce great things from it", and then started sowing the seeds with my staff members. Once we’d cooked the dish with the harvested crops, we decided to have Miyamoto-san be the first one to taste it. He is the owner of the garden, after all. We sent every plate to Kyoto for him to sample, and he gave us comments back like "This is a little too hot", or "This part tastes better now". Towards the end of development, we had him come and visit our "restaurant" in Tokyo. While he was here, we had him sample an unbelievable number of dishes. We had him eat until he was very full. So once we had the owner, Miyamoto-san, fairly satisfied with what he was being served, we had the general public try it out. We invited a large number of people to try it, and we invested a lot of time into this. By doing so, we adjusted the flavour while listening to our customers’ opinions and went on to complete the dish. For this title, I had asked Miyamoto-san to do only one thing, and that was to have Miyamoto-san do what only he could do. A 3D Mario action game hadn't come out in a long time, and I wanted him to make this into a game that would represent Wii. So, even on days off, I sometimes received e-mails from him telling us to change this to that, and from early in the morning to boot! (laughs) Though we were working at distant locations from each other, I really didn't notice the distance that much this time. We even had a setup where the game, which was being worked on in Tokyo, would be accessible in Kyoto at the same time. Also, I was really grateful that towards the end of the development cycle he often came to the Tokyo office for us. But I'm sure you had differences in opinion with Miyamoto-san from time to time, right?